^ Through the Glass Ceiling. Architectural Digest. 2015年3月 [2018年3月24日]. ^ Dame Zaha Hadid awarded Riba Gold Medal for architecture. BBC NEWS. 2015年9月24日 [2018年3月24日]. ^ The Guardian. Zaha Hadid: The only woman who won the Royal Gold Medal. 2016年11月29日 [2018年3月24日]. ^ Zaha Hadid, Groundbreaking Architect, Dies at 65. 紐約時報. 2016年3月31日 [2018年3月24日]. ^ Qureshi, Interview by Huma (14 November 2012). 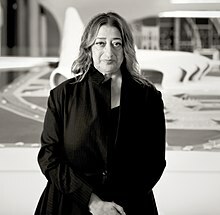 "Zaha Hadid: 'Being an Arab and a woman is a double-edged sword'" The Guardian. ISSN 0261-3077. Retrieved 1 April 2016. ^ Aller ^ "Iraqi-British Architect Zaha Hadid Dies of Heart Attack at 65". NDTV.com. Retrieved 1 April 2016. ^ "A warped perspective"The Daily Telegraph. Retrieved 1 April 2016. ^ "Zaha Hadid biography"Encyclopedia of World Biography. Retrieved 27 September 2015. ^ "Architects: Biography Zaha Hadid"floornature.com. 10 August 2015. Retrieved 27 September 2015. ^ Kamin, Blair (1 April 2016). "Visionary architect 1st woman to win Pritzker". Chicago Tribune. 2. p. 7.